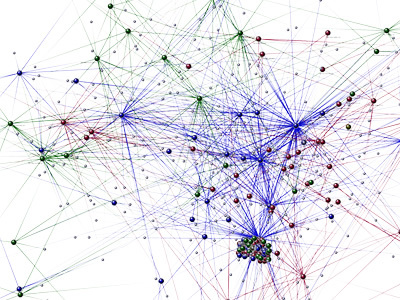 Web-mining.fr is a French website dedicated to web mining and network science. 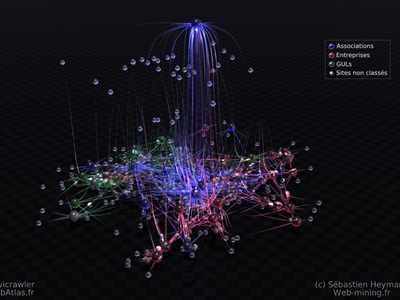 One of the projects they developed was a pre-analysis work for mapping a topological distribution of APRIL's members on the Web. APRIL is a French association for promoting and defending Free Software which federates roughly 110 companies, associations and LUGs (Linux User Groups). 1- An automatic navigation from the page adherents.april.org was traced by the WebAtlas crawler Navicrawler (3034 websites identified: 108 members' sites and 2926 neighbour sites). 2- A graph spatialization was then calculated by an algorithm to improve readability. 3- And finally, a graphical rendering was produced with POV-Ray. The main map (first image) represents one of these graph executions. APRIL's website is on the top. With the other associations (in blue), it constitutes the numeric "cement" which links companies (in red) and LUGs (in green) around Free Software issues on the French Web.